We are the oldest hydranencephaly support group. For 20 years we have provided information and given support to families, friends, and caregivers dealing with hydranencephaly. Hydranencephaly is a rare neurological condition in which most of the cerebral hemispheres are absent and replaced with fluid. Unlike in Anencephaly, which is a defect in brain development, in Hydranencephaly the baby’s brain develops normally until “something” happens to cut off the flow of blood to the baby’s brain or otherwise severely damage it. The affected part of the brain then starts to die and the tissue is resorbed by the body and replaced with cerebral spinal fluid (CSF). The “something” that starts this process can be quite brief. Some of the most common causes are a stroke in the baby, prenatal drug exposure, and the death of a twin in utero. In many of the children the cause is unknown. The damage to the brain usually occurs in the 2nd or 3rd trimester of pregnancy and can occur up to a year after birth as well. While the damage to the hemispheres is typically extensive, the child’s brainstem is usually (but not always) intact. Since in our experience there does not seem to be any clear relationship between what remains of the hemispheres and the abilities of our children, it seems that they rely largely on their brainstems for relating to their surroundings, for expressing themselves and for their various emotional reactions. Given the highly sophisticated neural mechanisms housed in the brainstem, this is not as surprising as it might seem at first blush. Although it is often thought that someone has to have a cortex in order to be aware and interact with their environment children with Hydranencephaly prove otherwise. You heard right: She had no brain, just a brainstem. The doctors said that she would die shortly after birth and if she lived, would be in a vegetative state. I always said that no one told Kayda that. She was a happy, alert, interactive child. Kayda loved music, stories, videos, being with family members, going on holidays and many other things. She hated most of all to be woken up and would stay mad all day if you were so rude as to disturb her. 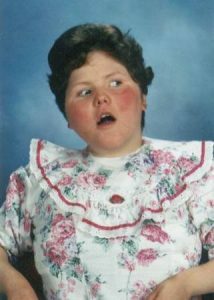 She attended school, went to Niagara Falls, Disney land and on many other holidays. 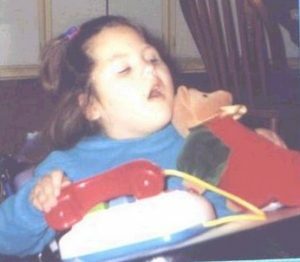 Yes, she was severely disabled and her life ended at the age of 11 1/2 but her legacy lives on and her story brings hope to many other families of children with Hydranencephaly. An important part of encouraging and supporting families has been the publications and information coming from what is called The Hydranencephaly Information Network. Over the years several different pamphlets and informational papers have been created. Most of those publications are available on this site.